Full Nutrition to fuel your Full Health, Life and Performance! PerfectAmino Power Meal combines the highly-utilized protein of PerfectAmino, with powerful Carb10, MCT oil, vitamins, minerals and superfoods to create an advanced and complete meal replacement shake. If you’re looking for better performance, optimum health, or a convenient way to get the proper nutrition, PerfectAmino Power Meal is the answer! PerfectAmino Power Meal was designed by Dr. David Minkoff to be a complete meal replacement. When we say complete, we really mean complete. Power Meal combines the latest developments in nutrition and energy with the powerful and proven PerfectAmino formula to deliver everything your body needs to power you through your day. Delicious, creamy, rich, chocolate flavor! Q. I AM VEGAN, DOES POWER MEAL CONTAIN ANY ANIMAL PRODUCTS? A. PerfectAmino Power Meal is completely 100% plant and vegetable derived from ethical sources. Because of the potential amino acid deficiencies that can occur in vegetarian and vegan diets, PerfectAmino Power Meal is a perfect addition to these diets and encouraged, to ensure complete nutrition and a well-rounded diet. Q. WHERE ARE THE AMINO ACIDS SOURCED FROM? A. 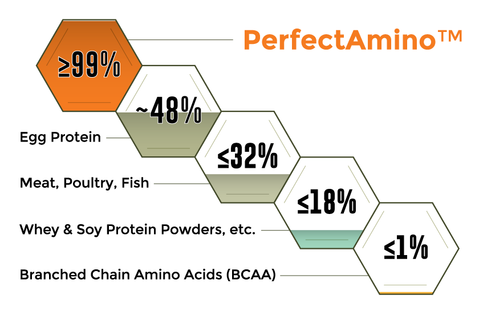 The amino acids in PerfectAmino Power Meal are derived from plant and vegetable based sources like beans and peas and mixed with a bacterial culture that breaks the plant matter down. The individual amino acids are extracted from this broth through centrifugation and then separated and purified. They are pure, pharmaceutical-grade, crystalline amino acids. There are no plant residues or sugars, yeast, gluten, soy, corn, wheat, rice, preservatives, or animal products. Q. HOW IS MCT OIL DIFFERENT THAN COCONUT OIL? ISN’T COCONUT OIL MOSTLY MCTS? A. Coconut oil contains 62-65% medium chain triglycerides, or MCTs. However, there are 4 types of MCTs and there is an important metabolic difference between them. MCTs are a form of fats with carbon chains between 6 and 12 carbon atoms long, C6, C8, C10, and C12. The most impressive health and energy benefits come with caproic acid (C8) and caprylic acid (C10), which comprises Power Meal's MCT oil ingredient. These are absorbed directly into cells and converted into the bioenergy currency of ATP in only 3 steps. Lauric acid (C12) is processed by the liver, not directly by tissue cells like C8 and C10 MCTs. Thus, while it is technically an MCT by name, it doesn’t metabolically behave in the same way as the others. Q. WILL POWER MEAL THROW ME OUT OF KETOSIS? A. Powermeal is 100% keto-friendly. The only carbohydrate in Power Meal, Carb10, does not raise blood sugar or insulin levels. Carb10 was tested in preliminary experiments and individuals taking up to 60g of Carb10 maintained full ketosis. Q. CAN I USE POWER MEAL WITH INTERMITTENT FASTING? A. Power Meal is a perfect addition to your intermittent fasting regimen. We recommend that you use Perfect Amino alone in the morning and then a shake for lunch within your 6-8 hour window for meals. Q. I AM DIABETIC, WILL THIS SPIKE MY INSULIN LEVELS? A. 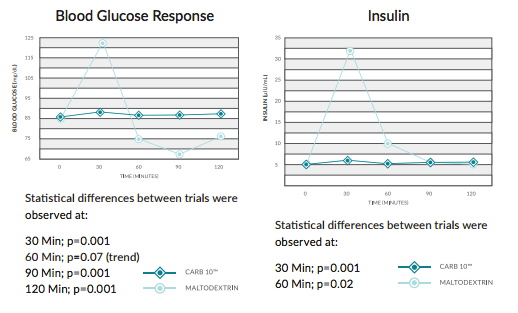 While Power Meal does contain Carb10tm, a carbohydrate derived from peas to meet the body’s energy demands, test show that it has zero effect on blood sugar and does not create any insulin spike. The other ingredients in Power Meal (PerfectAmino, MCT Oil, vitamins, minerals, and superfood blend) also do not raise blood sugar or spike insulin levels, making it easy to integrate into a diabetic diet. Power Meal gives you clean, sustainable energy without the rollercoaster of energy levels associated with other high glycemic additives found in many other protein supplements and meal replacements like sugar or maltodextrin.